ASTRA 7 was designed to demonstrate the feasibility of using a low-powered, lightweight commodity device (an HTC Trophy running Windows Phone 7) as a data logger, communications link and a portal to high performance computing resources in the cloud (through Windows Azure). 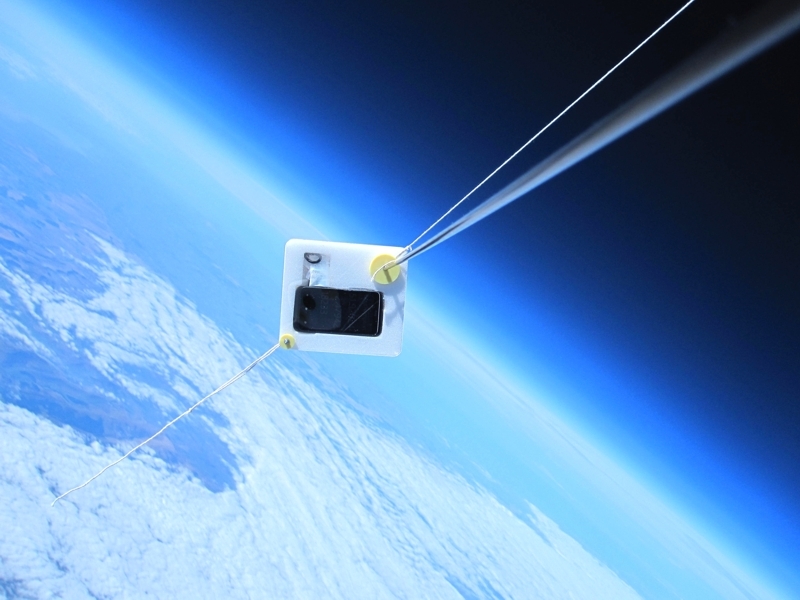 ASTRA 7 reached a maximum altitude of 18,237 meters during its 1h 16′ flight. The Segoz Logger apprunning on the WP7 operated, as designed, throughout the flight, providing location notifications to Windows Azure when in GSM range (with the Azure worker re-computing the forecast landing site each time). The maximum speed reached by ASTRA 7 was around 90mph, logged at an altitude of 10.1km, as the balloon-borne flight train was traversing the jet stream. ASTRA 7 landed 46.6 miles downrange (very close to the pre-flight prediction based on the ASTRA balloon flight simulation model of 47.7 miles). ASTRA 7 also took over 1200 photos during its flight (one of which is shown above). The launch was covered in the press by Computer Weekly (more images) and by the Guardian. Right-click image, click Save Target As (World Wide Telescope free download needed). Computer Aided Design (CAD) model of ASTRA 7. Final payload checks on ASTRA 7. ASTRA 7 begins its ascent. ASTRA 7 crosses the Welsh border, 18,000m (around 59,000ft) above the Severn estuary. The launch, as seen by the on-board camera. At 12,223m (40,101 feet) the temperature falls to a minimum of -64C as ASTRA 7 passes through the tropopause and enters the stratosphere. The beam (top left) bends visibly as a result of a spell of clear air turbulence.